A marketing throwdown: worms, 1…PR professional, 0. It’s a running joke among my friends and family that I find marketing lessons everywhere I turn. And recently, worms taught me a pretty big one. 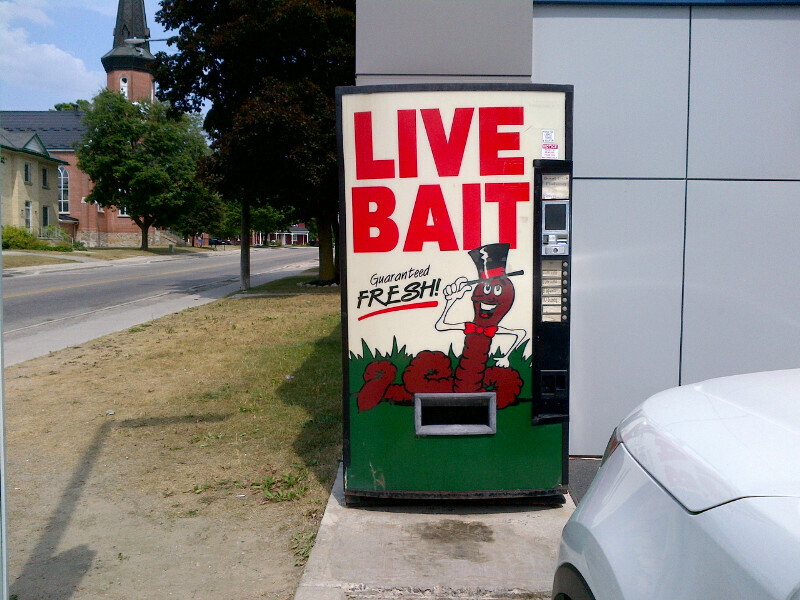 I stumbled upon this “Live Bait” vending machine while driving through the Muskoka Lakes region of Ontario, Canada. I wanted a soda. What I got instead was a new perspective. Until I got home, and then…Enter: GOOGLE. Turns out, worms are sold in vending machines all over the world. As are gold bars, live crabs, mashed potatoes with gravy, bicycles, fresh bananas, sneakers, hypodermic needles (scary), eggs, freshly made cupcakes, inflatable inner tubes, and a host of other items that I had never considered vending machine material. As I perused slide show after slide show of website articles revealing quirky vending machines across the globe, I felt like a dope. I had fallen prey to the cardinal sin of the PR profession: thinking something is NEW when it’s really just NEW TO YOU. How many times have my partner Vickie and I cautioned our clients against this very same PR sin? Shame on me. “A” for enthusiasm… “F” for marketing savvy. Google is the greatest tool in a marketer’s toolbox – see if your idea is new, find a unique solution to a problem, discover how other cultures conquer challenges…all in less than 2 seconds and without leaving your desk. Every new discovery is an opportunity – don’t be surprised if a Redpoint hotel client soon imports an Italian vending machine that prepares pizza from scratch, including freshly kneaded dough. I’ve been exposed to a lot of quirky stuff in my 20 years as a travel marketer. I know why fish wheels in Alaska are as treasured as Red Sox season tickets in New England, that women in Armenian nightclubs dance with themselves in the mirror to attract the attention of men, and that you can turn a tractor supply store into a bar in rural West Virginia (while still selling tractors) and no one will bat an eye. Each new discovery has fueled my sense of wonder at the world. But worms sold in vending machines trumps them all. Why? I thought it was so cool, it actually made me want to go fishing…just so I could buy some.